There are two ways that people choose to explore the Galapagos. Some people head out on a multi-day, live aboard cruise around the islands on one of the many Galapagos boats. While others base themselves on the three accessible islands of Santa Cruz, San Cristobal and Isla Isabela and book day trips. But for me it wasn’t a choice between one way of exploring the Galapagos and the other. I really wanted to explore the islands by boat but the independent traveller in me also wanted to do some of my exploration without an organised tour. Hence after I jumped off the Lonesome George after eight amazing days of visiting the islands, I jumped straight on a local ferry from the main island of Santa Cruz to Isla Isabela, the biggest island in the archipelago. I planned on spending three days on the island before heading back to Santa Cruz for my flight back to Quito . The journey from Santa Cruz to Isla Isabela usually takes about two hours. Ferry is a generous word for the small boats with huge motors that sweep you across the distance between the two islands. Unfortunately, one of the engines on our boat was going at less than half speed. Not only did this mean we arrived in Isla Isabela more than an hour late, it also meant that the ride was not comfortable at all. The broken engine unbalanced the boat, so we got thrown around a lot more than we should have been. Even the locals were looking a little sea sick. Lucky for me I’m not too prone to it! When we arrived on the island, one of the locals sitting next to me gave me the quiet advice to pick another boat company for my return journey. The pier is a little bit of a walk from the main part of town so I jumped into a shared taxi (essentially a minibus) and headed in the direction of Posada del Caminante, a guesthouse that friends from the Lonesome George had recommended to me. Like almost everywhere that is cheap on the Galapagos, it is very difficult to pre-book anything. But they had plenty of room when I arrived. I paid $45 USD for three nights in a 3 bed, female dorm. The hostel was nice with a cool chill out area with lots of hammocks. I spent a lazy afternoon in one of those hammocks with a book! They also did all my washing for a donation (it was a pay what you want type of situation). Just be aware before you head from Puerto Ayora to Isla Isabela to get all the cash you will need out of the ATM there. There are no ATMS on Isabela! I’d booked two tours for my time on Isabela- the famous snorkelling trip to Los Tuneles and a volcano hike. I was told I’d be doing the volcano hike on my first day and the snorkel trip on my second. Hence on the morning of my first full day I was fully equipped for hiking- with snacks, a huge drink bottle and my hiking gear all on. Apparently, my tour company had fucked up (or rather just overbooked the volcano hike) and I was told I’d be doing the snorkel trip instead. After a quick change into a swimsuit and a repack of my bag, I was headed the short distance to the snorkel shop to get all the gear for the trip. Los Tuneles is one of the most famous spots on the Galapagos. Everyone I met on the islands, or even beforehand in Galapagos that had visited Isla Isabela raved about this trip. Los Tuneles, or the Tunnels is not too far of a boat ride from the main town of Puerto Villamil. It didn’t take long before we arrived at the spot and realised how it got its names. Los Tuneles is an often-shallow snorkelling spot made up of what looks like lots of tunnels formed from volcanic rock. Before we even got in the water we spent some time on land wandering around the pretty and wild landscape and even spotting some more gorgeous blue-footed boobies, the famous residents of the islands. 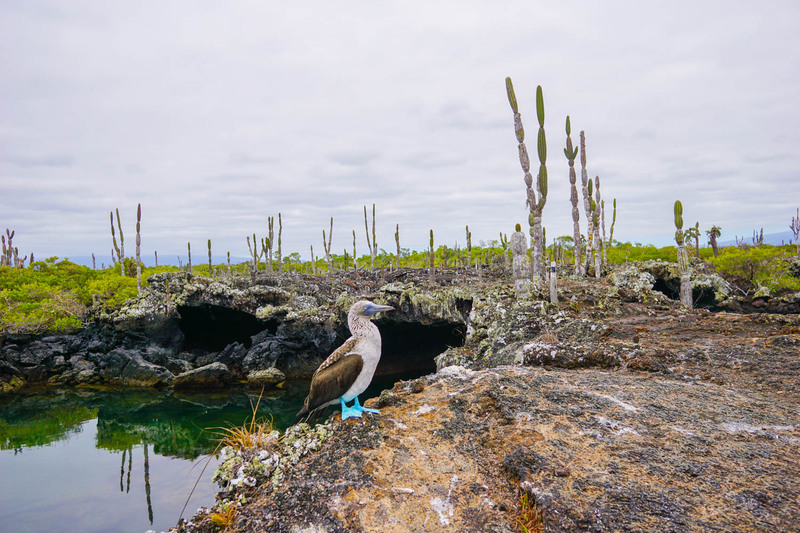 The Galapagos Islands, in conjunction with the Ecuadorian government is really concerned about conserving and protecting the natural environment in and around the archipelago. That often means balancing the needs of the marine and land life, with the tens of thousands of tourists that arrive on the island every year. To do this, any organised tour must be accompanied by an official Galapagos island guide. They train extensively and are independently employed by the catamarans and/or the day trip tour companies. During my time on the islands I had three guides- my guide on the Lonesome George, my guide at Tuneles and my guide on the Volcano Hike. My guide for Los Tuneles was by far the best guide I had. He wasn’t just knowledgeable about everything around us but you could tell how passionate he was in his job. Even before we stepped foot in the water he had given us a range of warning about touching the animals, getting too close to them, and approaching them in the right ways. Once we got in the water he easily found everything that we wanted to see. Los Tuneles is famous throughout the Galapagos because of the amazing marine life that is flourishing there. Snorkelling around the area made me feel like I was in an aquarium. I spotted many of the marine animals I’d already had a chance to see on the Lonesome George; sea lions, sea turtles and white tipped reef sharks. But I also got to see a seahorse for the first time which was super exciting. It was a lot smaller than I expected it to be! At $120 USD for a half day trip (leaving in the morning or afternoon), Los Tuneles is one of the most experience day trips on the islands. But given just how spectacular it is, I think it is worth the little splurge. My major reason for changing my flight so I could get to Isla Isabela was being able to do the volcano hike! Sierra Negra is an active volcano located on the South of Isabela, not too far of a drive from the main town- Puerto Villamil. And when I say active, I do mean active. The last major eruption occurred in 2005, so not very long ago at all! Sierra Negra doesn’t look like most of us would picture a normal volcano to look like. It doesn’t take the shape of a huge mountain with a peak that bubbles over. The Sierra Negra takes the shape of an upside-down bowl. And inside that upside-down bowl is the second largest volcanic crater in the whole world. The volcano hike takes you up to the very edge of the crater. Then it’s a huge walk along one side of the crater. In all it took us about four hours of hiking. Our group quickly became splintered because our incompetent guide didn’t seem to be prepared to wait for a group of varying levels of fitness. It isn’t the hardest hike in the world, but there are a few uphill bits that challenged me at time. But keep in mind I am incredibly unfit! It’s a pity the hike can’t be around the volcano. Because it was essentially a two-hour hike to one point, and then two hours back the way we had come. Lucky for us, on the way there the cloud cover had lifted and we could see right into the crater below. You absolutely can’t go down there because it is active and supposedly you’d probably burn or boil to death. Given that the clouds could return at any time, I blatantly ignored the guides direction to hurry up (he said we would have plenty of time to take photos in another spot) and grabbed some photos while I could. Some of my friends had done the tour another day and not even been able to see the crater! The walk back was tiresome because it was the same way, just in the other direction. And the clouds had descended so we couldn’t even stop and admire the sheer vastness of the crater like we had on the way there. Everyone who does this hike seems to have mixed thoughts on it, but for someone who has never seen a real volcano, especially that close, it was incredible! My spare day was meant for me to do lots of the activities on the island you could do on your own. You can snorkel right from the pier in Puerto Villamil and apparently, it is good with lots of iguanas and penguins. Some of my other friends hired bikes and went for a bike and hike to some of the lagoons to see some flamingos and the Isabela giant land tortoises. But after 10 jam packed days on the Galapagos I had hit a huge level of exhaustion. So, I spent my last day wandering around the town of Puerto Villamil, stopping for some food, and then heading back to my guesthouse to read my kindle in the hammock. I think my favourite thing about Isabela was that it really felt like a community. Puerto Ayora seems like a town for the tourists, Isabela is where the actual residents of Galapagos mostly live. There are kids playing soccer at night, people wandering around chatting to each other, and food markets that aren’t ridiculously overpriced. Eating on the island was surprisingly cheap. I found heaps of lunch and dinner deals for around $7 USD. These usually included a soup, a main dish and a juice. But mostly I add at the Shawarma place (Shawarma Hot). It was surprisingly fantastic and a great break from meat, beans and rice!